Following in the footsteps of films like Earth, Oceans, African Cats, and Chimpanzee, Alastair Fothergill and Keith Scholey’s Bears is the latest Disneynature documentary released to coincide with Earth Day. Bears does not break any new ground in the nature doc genre, and the storytelling is old-fashioned enough to invite comparisons to Disney’s True-Life Adventures series from the 1950s, but it is also a grand technical achievement and a stirring family entertainment. 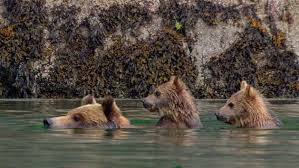 The film follows a trying year in the life of Sky, a female brown bear in a protected portion of the Alaskan wilderness, as she tries to lead her two ridiculously adorable bear cubs to the salmon pools. Over the course of the year, Sky will have to shepherd her cubs over treacherous mountains, protect them from wolves and aggressive bears, and fend off exhaustion and starvation in a desperate attempt to store enough food to make it through the next winter. Of course, the kid-skewing Bears paints this bestial life-or-death drama with the usual Disney brush, de-emphasizing disturbing or dispiriting elements in favor of measured suspense, awe, inspiration, high spirits, and moral tales. Not to mention insanely cute, humanized without being anthropomorphized baby animals! The cubs are dubbed Amber and Scout – the latter is a rambunctious male whose adventurous spirit nearly gets him killed – and they are the real stars of the film. John C. Reilly narrates with the broad doofiness of a fun uncle, but he also has the acting chops to sell emotional moments without getting broad or bathetic. Reilly is somehow able to strike a balance between gravitas and warmth, and his narration is indispensable to the film’s genial nature. The story does get a little tacky and forced at times, and the accumulation of cute moments occasionally devolves into something resembling an episode of Alaskan Brown Bear Cubs Do the Darnedest Things. Animals occasionally need to yawn, stretch, or scratch themselves…who knew? Still, even as I acknowledged the artificiality and absurdity of projecting human traits and emotions on to inherently wild and unknowable creatures, gosh darn it if my heart didn’t race, sink, leap and break upon the filmmakers’ every cue. Between the two of them, directors Fothergill and Scholey have worked on nearly every Disneynature production, and they capture some truly beautiful images here. An early sequence that shows the bears narrowly avoiding a massive avalanche is a powerful display of the natural world’s brute strength, and it should play brilliantly on IMAX screens. But there is just as much wonder in the smaller moments, such as the easy flick with which Sky slashes a mussel out of its shell, or the way a bald eagle gracefully perches on a treetop branch. For better or worse, Bears has been scrubbed clean of any eco-political messages, other than a generalized appreciation for the power and beauty of nature. However, in a somewhat surprising turn, the film does emerge as a touching ode to the fierceness and determination of single mothers. The tough and tender Sky is the hero of Bears, and her single-minded determination to protect her babies from the dangers of her world ultimately makes her a role model to her mentor-seeking son. From the studio that gave us Bambi’s Dad and Mars Needs Moms, that’s progress.